From the Potomac: If You Think the Media Is Weird Now . 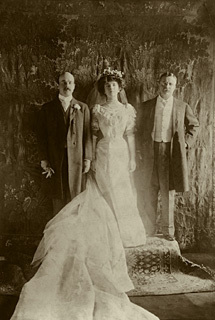 . .
"The day on which the wedding of Theodore Roosevelt's daughter took place was heaven-made. Night's curtain melted under the early glints of gold low down in the east, there came a few moments of coloring such as sometimes marks the palette of a painter of pictures, and then the splendid burst of light as the sun climbed to its place in stately procession until it had reached its zenith and bestowed its full, voluptuous kiss upon the earth . . .
"In the splendid East Room of the White House a stately bishop of the high church had spoken the words which made a wife of the artless child of the nation. Yes, artless and free from guile as though she were a child of the plain instead of the daughter of the Chief Executive of the nation, and in no better manner could her sweet, democratic simplicity have been shown that when . . . she tripped down from the altar like a school girl. . . .
"Miss Roosevelt ... at all times ... has so borne herself ... that no ungenerous act or ill-considered utterance has ever caused her friends, the American people, to think less well of her. They have come to see in her the embodiment of those fine qualities which make the American woman superior to every other."